When creative people get to make the movies they really want to make, strange things can happen. Flush from his success with The Razor's Edge, Tyrone Power lobbied Darryl F. Zanuck to play the lead role in this creepy, very anti-glamorous movie about carnival con games, fake mentalism and predatory spiritualism. The film abounds with unpalatable people and unpleasant ideas and its sordid carny background seems authentic. Even more disturbing is its very noir atmosphere of moral defeat and universal venality. In other words, Nightmare Alley is one special movie. Stanton Carlisle (Tyrone Power) helps Zeena (Joan Blondell) with her cheap mentalist act because her alcoholic husband Pete (Ian Keith) is too sodden to perform before the public. He gets Zeena to share Pete's valuable code-based trick, and beautiful carny performer Molly (Coleen Gray) learns it as well. Strongman Bruno (Mike Mazurki) isn't happy about that, but after Pete suffers an unfortunate accident, everything changes. Molly and Stanton marry and leave the carnival for Chicago and a successful nightclub routine. Stanton combines Zeena's code with his personal intuition to build a substantial reputation as a mentalist, and is aided by the mysteriously suave consulting psychiatrist Lilith Ritter (Helen Walker) in spreading his influence among the North Shore elite. He sets himself up as a spiritual conduit to the afterlife, as a way of fleecing wealthy people who have lost loved ones. Suddenly offered vast fortunes by gullible millionaires, Stanton feels he can do no wrong and coerces Molly into aiding him in the cruelest swindle of all. Nightmare Alley was a huge flop on release, only to become a notorious 'film to see' when a legal hassle made it a scarce item. Savant saw it once in the 1980s (in a class given by one of the disc commentators, James Ursini) and that was a privately owned print. 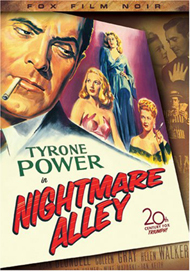 It's easy to see why Darryl Zanuck underpromoted Nightmare Alley so it would not sully Tyrone Power's star image. Not since Freaks had there been a show as revealing about the underside of the carnival racket. Postwar audiences were ready for tougher themes, but few wanted to know what a Geek is, let alone see their favorite matinee idol transformed into one. Nightmare Alley is about swindles, confidence games and other abuses of trust. Stanton Carlisle learns the craft of fleecing suckers on the carny circuit, a talent that makes him feel like a privileged insider, with all the rubes on the outside. He learns from the best but his ambition takes him even higher. As soon as Stanton has a legitimate and profitable entertainment act going, he misjudges his own powers and overreaches. He knows he has a special talent when he dares to run a con on a sheriff threatening the carnival. After that success he thinks he can get away with fooling everyone. People expect to be tricked in a sideshow booth and will chuckle pleasantly when a stage magician pulls off apparent miracles on stage. But they don't take kindly to tricksters exploiting their personal problems to raise false hopes for monetary gain. Stanton crosses that line the moment starts playing with a vulnerable old woman (Julia Dean of Curse of the Cat People). She misses her daughter and falls for Stanton's claims that he can communicate with her from the next life. Stanton discards Zeena and dismisses Molly. When he deceives other people he isolates himself, and when he drops his friends he's left alone with his own imperfect psyche. He has issues of guilt - at one point he owns up to his selfishness - and he starts to believe in the superstitious Tarot cards that Zeena allows to run her life. The trickster is himself easily tricked. Carlisle meets his match in the sphinx-like Lilith, a crafty player who always conceals her game. He admits that his mentalism is a racket, but the slick psychoanalyst never admits to anything. She may very well have lured him for her own purposes. Stanton discovers the recordings she makes of her patients and would love to use them as fuel for his confidence games. The question is, how completely corrupt is she? It's difficult to tell when Stanton is being sincere, but figuring out what's on Lilith's superior mind is an impossibility. Stanton is a troubled mix of villain and flawed hero. He admits he's a crook but claims he's only accepting money offered by people who can spare it. He scoffs at Zeena's cards and Lilith's psychoanalysis, but in the end believes in them both. He's the master of what he calls 'the Gypsy switch' - misdirecting the rubes - but is himself fooled by his own tricks when he trusts the treacherous Lilith. 1947 audiences doubtlessly found Stanton's final con games to be distasteful in the extreme, especially when he breaks his own rules and allows the concept of God to enter his spiel. That blasphemy is what spooks Molly and causes disaster for Stanton's plans. Ironically, the fact that blasphemous behavior triggers Stanton's immediate downfall might be the very reason that the Production Code censors okay'ed this edgy story. Stanton's rise and fall follows the same symmetrical pattern of Alex in A Clockwork Orange (thank you David Gaudio) - the last scenes of the film mirror the beginning as Stanton returns to the carnival to accept his 'predestined' fate. As with the engineer at the conclusion of I Am a Fugitive from a Chain Gang, Stanton's final line "Mister, I was made for it ..." is a chilling refrain. We've already heard foreshadowings for Stanton in the form of a haunting audio sampling of the Geek's screams, weirdly layered over a few scene fadeouts. Of all the losers in film noir, it's hard to think of any brought lower than Stanton Carlisle. The horrible deaths in films like Night and the City and Criss Cross seem preferable to this dreadful fate. I can also see 1947 audiences looking at each other when the lights came up and asking, "Did I just see what I thought I saw?" Mainstream movies as elegantly sick as this one wouldn't become common until the 1970s. Tyrone Power's acting is remarkable; he convinces totally as a supremely clever trickster who doesn't know his own limitations. Joan Blondell has her best role after her Warners heyday, and even Coleen Gray (Red River, The Killing) is impressive as the one character with an unshakeable sense of ethics. It's the best role for the haunting Helen Walker, who makes Lilith Ritter an irresistably powerful woman, and a manipulator who never shows her cards until the time comes to spring the ultimate trap. Mike Mazurki has one of his few roles as a likeable fellow, and Ian Keith is frighteningly real as a confirmed alcoholic. Audiences had barely been introduced to taboo-breaking alcoholic characters; The Lost Weekend was only two years old. Nightmare Alley is a little more honest about what real degradation through booze might be like, and very honest about the moral complexity of evil. Fox's DVD of Nightmare Alley starts with a logo that looks terrible but the rest of the film is fine or satisfactory, with just a few scratches here and there. Lee Garmes' expressive lighting is well-represented - lots of creepy shadows and eccentric portrait shots. The soundtrack is also clear and gives us a good listen to Cyril Mockridge's dynamic score, which never sounded this good on 16mm. The trailer provided has no text or narration (it's obviously for foreign version use) and is difficult to understand for that reason. The big extra is a commentary by the now ubiquitous Alain Silver and James Ursini, who look at the film from several angles. Silver marvels at its audacity to be so mature and uncompromised, while Ursini recounts how the unhappy peronal story of its author William Lindsay Gresham mirrored some of the themes in his book. Both commentators seem to think that Stanton does indeed develop some personal form of ESP; I think that he's following his excellent instincts and intuition, and likes to take chances that happen to pay off. Lilith's trick question about her mother could be guessed at, which is exactly what Stanton said he did. If I believed he was actually psychic, I'd also have to believe that pro golfers willed some of those impossible putts they make with seeming ease. That's probably what it feels like for the golfer: "I wanted it to go in, and it did!" Stanton starts to think he's infallible, and therein lies his Achilles Heel. 1. This, of course is a great line to use whenever you see somebody being talked into something they don't want to do - a hateful thing that happens so often in peer groups, even when only a small compromise of someone's self-esteem is at stake. If you do what a Geek does, you are a real Geek. It's a great lesson quote.